This has been a good year for astronomical research. 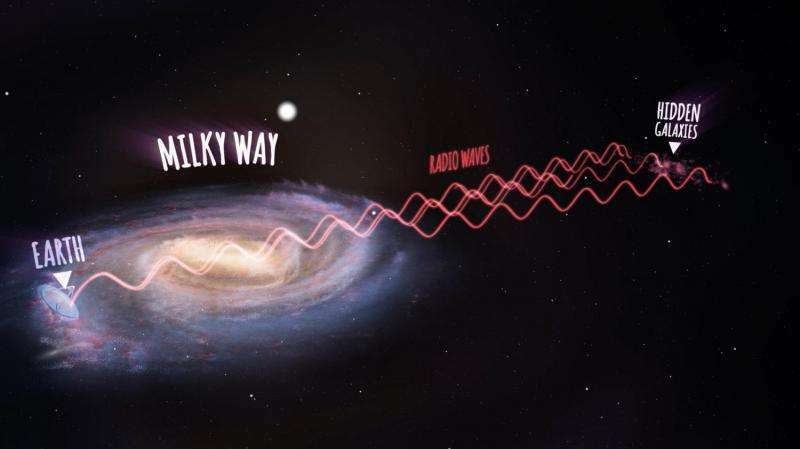 Radio waves have been used by the astronomers to get a closer look in the galactic mass and stardust of the Milky way, and while doing this they found out hundreds of galaxies nearby which were never discovered previously by any other astronomer in history. A total of 883 galaxies were observed by the scientists out of which 1/3rd were never seen by anyone before. This was done by the scientists while using CSIRO Parkes radio telescope in Australia. Previously, while the rest of the hidden galaxies were found to be 250 million light years away from the Earth, their relative closeness (when talking in astronomical terminology) shows how the space neighboring us is getting all crowdy and filled with galaxies which were never observed before. “The Milky Way is very beautiful of course and it’s very interesting to study our own galaxy, but it completely blocks out the view of the more distant galaxies behind it,” said astronomer Lister Staveley-Smith of the International Centre for Radio Astronomy Research (ICRAR) at the University of Western Australia. As far as the new hidden galaxies that are found, lie within an area known as the Zone of Avoidance. This area is called with the name mentioned because the view specifically of this region in space has not been really clear because of the planets and the stars (which make the Milky Way) are in the way. But the credit goes to the Parkes radio telescope since it is not effected by such obstructions. And the huge amount of mass under discussion led the scientists to better understand the cosmic phenomenon in the Zone of Avoidance. The great attractor anomaly, as the scientists call it, which seems be a mysterious space region drawing in the Milky Way and other many galaxies towards it. This anomaly which scientists believe equates more to the gravitational force of a million billion Suns since it was first observed and discovered in the 1970s. But the newly discovered number of hidden galaxies might help explain what is actually going on around in this space.